Hook up the baler and make silage or hay bales as the baler picks up the bales and drops it out the back. This is all played out in the imagination of farm play mind you, as die-cast replica toy balers don't really make bales but do often carry and drop-out plastic toy bales as you move the tractor and baler along. But as a rule of thumb, toy square bales are easy to stack and store with rounded bales to awkward to stack up. 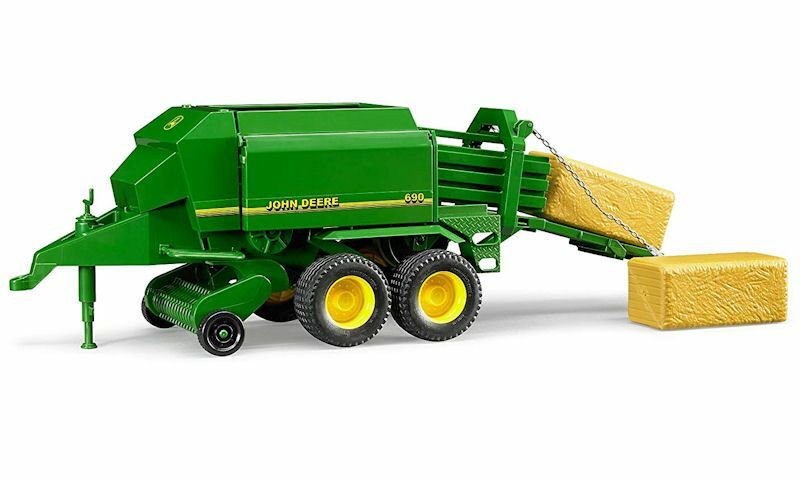 Big toy hay baler like this Bruder John Deere baler in 1:16 scale has lots of functional parts including the bales being ejected from the rear. 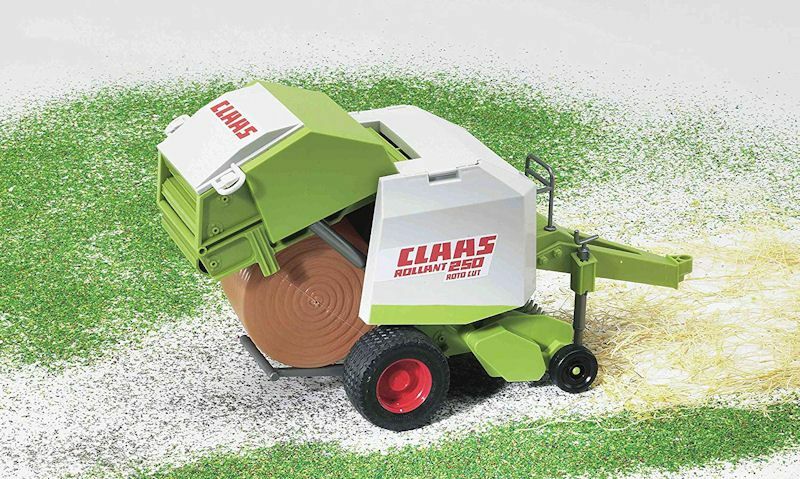 Toy balers can learn you all about baling, inviting the child to hook up the machine to the tractor and heading out to the field to make bales. They will discover grass is used to make silage bales and hay bales to make vital animal feed and bedding if they keep toy cattle. 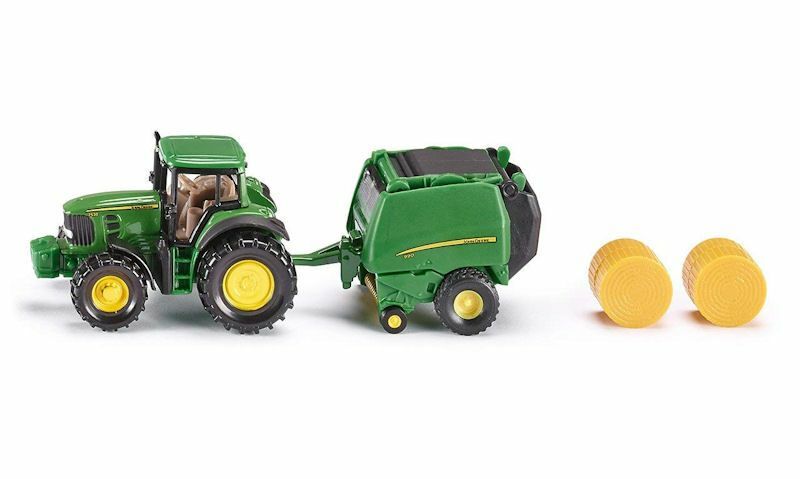 Siku John Deere tractor towing a round baler, obviously the bales don't process through the baler but they can be carried around inside the toy baler. You are spoilt for choice when it comes toy balers with highly detailed exterior and functioning internal parts as you move the baler on its single or twin axle. You should get a matching round or square bale as they are placed in the baler and dropped out the rear. Look to Britains and Siku balers for 1:32 models, but Siku also do fun size single tractor and baler set in 1:72 and 1:87 scale. But if you need a big baler with easy to access functioning parts go for Big Farm and Bruder, depending which make you like best. In real life John Deere balers are the most impressive, with Kuhn, Krone, New Holland and Claas also impressing with replicated scale models available from Britains, Siku and Bruder. These brands represent official licensed toys, so you know you're in good hands. What are balers used for? Balers are a farm implement towed behind a tractor moving across a hay or forage field as the internal machines chops and turns the hay or grass. This is complete with storks and heads which turns it into a compact bale, making it easy to handle, transport and store. A round baler contains a belt which is used to turn the mechanics that rolls up the bales into a tight cylinder shape, ending with the bale rolling out the back of the baler and left on the field. But the machinery is a little more complicated when producing square bales. What happens to the bales? Balers automatically release the finished bales by dropping them from the rear as the baler moves along, leaving them equally spread every several yards across the field. This leaves freshly cut forage or hay bales dotted across the fields which can be picked up by a telehandler or tractor with front loader. They're then loaded up onto an awaiting tractor trailer or a lorry trailer, then driven back to the farm to be stored in the barn or silage pit.